Midgley United inflicted a first Halifax AFL Premier Division defeat of the season on title favourites Ryburn United with a 2-1 home success on Saturday. Craig Gee’s men produced the perfect response to the previous week’s derby defeat by Hebden Royd Red Star at the same venue and climbed to third in the table. Midgley’s man of the match George Bamford said Ryburn had probably played the better football but Midgley had showed great determination to defend a 2-0 interval lead. Ryburn started the better without creating much but fell behind on 25 minutes when Greg Spink scored with a 25-yard free-kick, placing the ball around the wall and into the bottom corner of the net. The advantage was doubled five minutes before half time from a free kick on half-way. The ball was pumped into the box and the unmarked Joe Gibson flicked a header past the advancing ‘keeper. Midgley’s Gareth Swain made a sliding save to deny Reece Uttley before the break and Ryburn had a Christian Silkstone goal 10 minutes after the break controversially ruled out for offside. Midgley saw their advantage halved midway through the second period but missed chances to kill off their foes as Ryburn threw caution to the wind. Hebden Royd Red Star, who won only once in the league in the first half of the season, made it two wins out of two in 2018 with a 9-1 thumping of visitors Illingworth St Mary’s. “It took the fear of relegation to get us going,” said player-boss Chris Garbutt, whose side made a flying start on Saturday with a first-minute goal from Lewis Cockroft against bottom side Illingworth. The visitors then had a decent 20 minute spell before Dan Pugh doubled the lead, turning on the edge of the area and curling the ball into the top corner. An own goal, when a Patrick Thomas cross went in off a defender, left Star sitting pretty with a 3-0 advantage at the interval. Garbutt said Illingworth had capitulated in the second half. Cockroft got two more including a great left-foot volley into the top corner; skipper Dan Lumb rounded the keeper before knocking the ball home; Will Chadwick bagged a brace; and Tom Barclay got the other. The only disappointment was that Star were unable to keep a clean sheet, Saints replying when Star had scored “about six or seven”, according to Garbutt. Things are looking up for Calder ‘76, who made it back-to-back wins after a long barren spell with a 3-1 home success against high-flying Shelf United. Kieran Sim was outstanding at the back for Calder, who took the lead just before half time when Steve Jones sent over a great cross and John Moynes continued his good scoring run with a header. Shelf hit back 10 minutes into the second half with a superb finish by Luke O’Brien from an almost impossible angle and it was slightly against the run of play that Ben Oldfield restored the lead with a powerful half-volley shortly after. The killer third goal came with 20 minutes left, Moynes winning the ball in midfield and feeding Nathan Dempsey. Two Shelf defenders got in each other’s way and Dempsey went through one on one with the keeper and took his chance early, tucking the ball into the bottom corner. Sowerby United were 3-0 home winners over Northowram, who are second from bottom after finishing runners-up last season. A wonder goal from Jake Allott after 12 minutes put the home side ahead. His firm and well-directed side foot from 35 yards sailed into the top corner. Sowerby’s lone front runner Rory Thickett fired over before a flighted pass from Northowram’s Alex Abson’s released Lewis Oldridge, who rounded the keeper but Dan Crosland made a vital block. 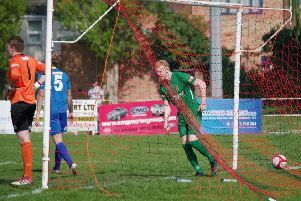 Crosland doubled the lead from the penalty spot after 27 minutes. The Rams had much more possession in the second half but didn’t pose much of a goal threat and a quick Sowerby break and the persistence of Harvey Walsh set up Macaulay Nortcliffe to sweep home the third goal after 75 minutes. Late on Josh Baines’ shot hit the Sowerby bar and bounced down but not all of the ball was adjudged to have crossed the line. Second-placed Sowerby Bridge were emphatic 7-2 winners at Greetland to slash Ryburn’s lead to five points. Man of the match Luke Maguire and Damian Watkins scored hat-tricks for the visitors with Joel Cleary getting their other goal. Aaron Dorward and Adrian Ford replied for Greetland, who had been beaten by the same score in the county cup at Golcar the previous week after a good start to the season.